If you haven’t read the 1st part of this blog post, we recommend reading it first. 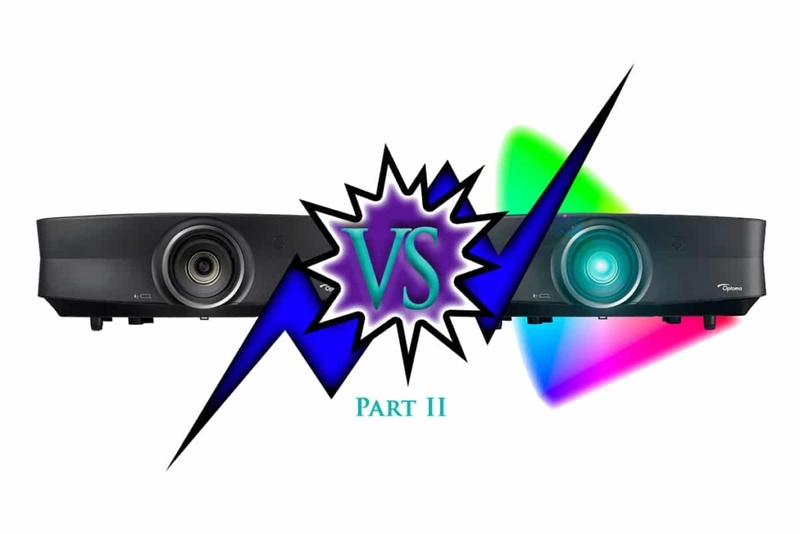 One of the great things about increasing contrast and extending the color gamut of a projector is the new look and excitement it can give to existing movies in your library. Since conventional Blu-ray discs are HD resolution and color graded by the studios to REC 709, the projector must upscale the image to UHD, and in the case of the Upgraded UHZ651, it is also possible to map the REC 709 to either DCI-P3, as it was in the theaters, or even all the way to REC 2020 with simulated HDR dynamic range and contrast. 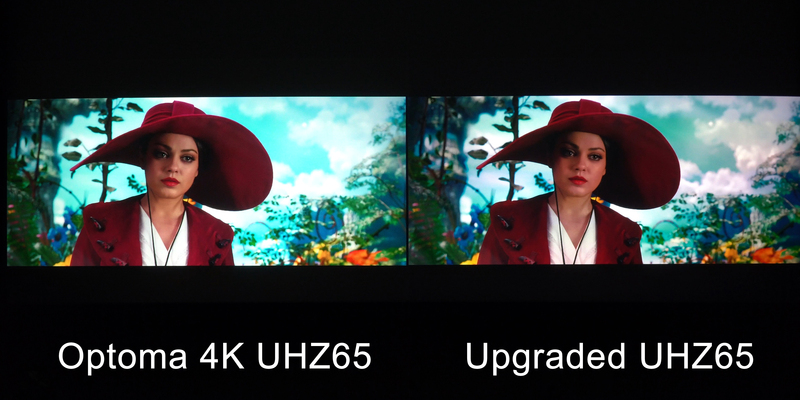 In this scene from The Great and Powerful OZ, the HD Blu-ray is scaled to 4K UHD on both projectors, and the Upgraded UHZ65 can color map to DCI-P3 color space. When viewed on a wide color gamut display, significant differences can be seen in the deeper greens, yellows, and reds in this image. The standard UHZ65 can use a slightly improved color at 106% of REC 709 in its Cinema mode, and the Upgraded UHZ651 can use its DCI-P3 mode and map the colors to over 140% of REC 709. The DCI-P3 is the current standard for commercial motion picture theaters and some of the new higher-end UHD 4K projectors are beginning to approach that level of color. Unfortunately, most cost upwards of $18,000 to get there. For those who appreciate deep rich reds and extended colors like I do, the UHZ65 can offer a more affordable alternative for those who do not need the 3D or fast response times for gaming. As can be seen above (again from The Great and Powerful OZ) the increase from REC709 to DCI-P3 on the right is a subtle yet dramatic improvement in both color and contrast when this is viewed on a monitor or display capable of DCI-P3, but unfortunately is still somewhat rare and expensive. It is also possible on the Upgraded UHZ651 to map the colors to REC 2020 in the HDR Sim mode. I have mixed feelings on this mode as Optoma has chosen to try and do very dramatic contrast, and going from REC 709 all the way to REC 2020 is a bit of a stretch. Nevertheless, it is possible on the upgraded version1 to go all the way to 80% of REC 2020, and the HDR Sim mode is even brighter than the DCI-P3 or Cinema modes on both projectors. We recommend the HDR Sim mode for those who want or need the extra brightness, but normally we would recommend the Reference or Cinema modes for most HD Blu-ray movies. One of the best, and most dramatic, things about the new 4K Blu-ray discs is the bit sampling improvement to 10-bit and the expanded color and dynamic range that can now be enjoyed for the first time in our homes. Previously, DVDs, streaming, and HD Blu-ray discs only delivered 8-bit sampling. In addition to a more dynamic and exciting image, the 10-bit also can improve the smoothness and practically eliminate the banding in smooth gradients like the sky or in sunsets. Even though most of the dynamic range is not possible to see on non-HDR displays, like the majority of computer monitors, the improved contrast and some of the color difference may be visible on a normal display. In this scene from Jumanji: Welcome to the Jungle, the improved contrast and color can be seen even in the skin tones and details in the jacket. Even though the Upgraded UHZ65 projector on the right is about 30% less bright for black and white lumens, the improved color and contrast make the image to appear almost as bright or even brighter on some scenes due to the improved color. 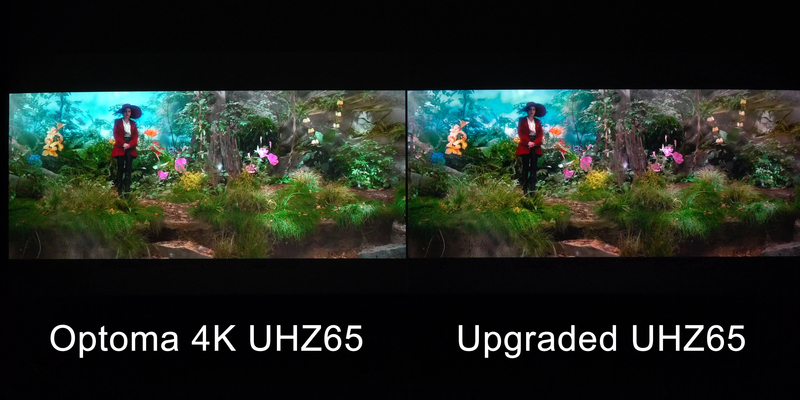 On most monitors, the Upgraded UHZ65 image on the right, as well as when viewed in person, appears to be as bright or brighter than the unmodified UHZ65. This is part of the Helmholtz Kohlraus effect and the reason there is an effort underway to change the way expanded and pure color projectors are rated. HDR stands for High Dynamic Range and is really a step forward in terms of electronic image display. It allows for a much wider range of luminance values than previously possible. It is a higher level of realism and begins to approach a much closer reality to what we can actually see in real life. When this is coupled with a wide color gamut, such as DCI P3 and even 80% of REC 2020, it becomes a much more involving and realistic representation of what we can experience in nature. What is very confusing is how some manufacturers simply indicate that they are DCI-P3 or REC 2020 “compliant” or other somewhat confusing terminology. You might think that means they actually do DCI-P3 color space or RE C2020 – but not necessarily. What some are trying to indicate is that the color that it can do (usually at, or just over, REC 709) is re-mapped to those wide color gamuts. They cannot actually do the wider color – they just use the color space specifications to put the colors they can do in the right places. If manufacturers really do a wider color gamut they will usually show you a chart or a percentage of what they can do. When HDR and wide color gamut are both presented in a good image the result can be very captivating. When you look at this image from Guardians of the Galaxy II at full size you should be able to see the contrast differences and even some of the color differences that are present. The full HDR range cannot be shown without a full HDR display but some of the other differences should be visible. One of the side benefits of wide color gamut is the increase of color detail and subtle hue changes that increase our visual perception and sense of reality of the image. Within many colors in nature, there are varying degrees of the main color. Many, or most of these differences, can be lost when the display is not able to display most or all of the visible colors. When a projector is able to display more of these colors, we see not only details that were not visible before, but the image takes on a more dimensional characteristic to it that is hard to describe – almost like a three dimensional image without 3D glasses or dual images. In this scene, from Planet Earth II, there are many shades of green and blue. If you look carefully you may be able to sense the many shades of additional greens and blues that the image on the right is able to display. They are both amazing images in 4K HDR, but the Upgraded UHZ65 adds that extra punch and is more dynamic to see in person. Our goal in upgrading the UHZ65 was to increase the color gamut and improve the blacks. We feel these goals have been achieved and it provides a new and higher level of HDR and wide color gamut experience. As we stated in the beginning – this projector is not for everyone. For those who are competitive gamers and those who have a 3D Blu-ray collection, this may not be the projector for you. But for those who have a budget under $5,500 and appreciate the expanded color and improved blacks and contrast – this may be a good fit. There are also those who are sensitive to the DLP rainbow effect and, even though it is very minor on this projector, it could be a factor and worth considering as well. 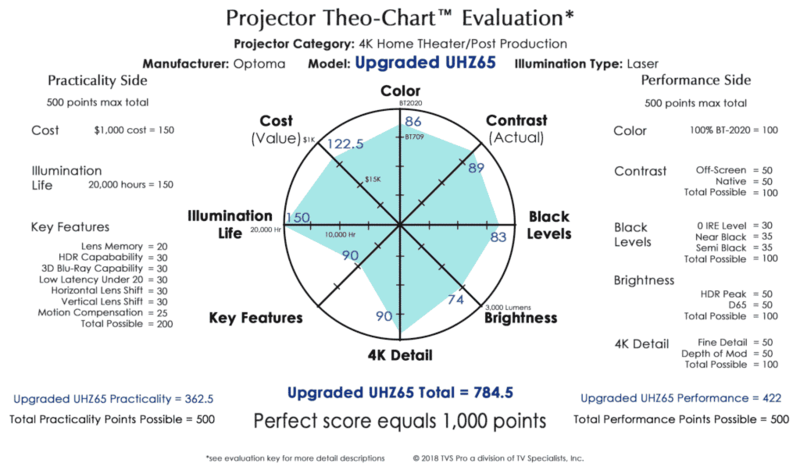 The Theo charts were created to allow a comparison between projectors without just looking at technical specifications but using actual measurements and taking into consideration the actual cost, and in some cases the practicality of the projector. Since the Upgraded UHZ651 projector improves the color, contrast and blacks of the projector there must be some downsides as well. The downside of the Upgraded UHZ651 is the added cost and the decrease in overall light output, as can be seen in these charts. Although to the eye, and in most side-by-side comparison scenes with some level of color present, the difference in perceived brightness is a little confusing as it does not look less bright. However, if the image is mostly white there is a visible difference: the Upgraded UHZ651 is less bright. We recommend screen size be kept to 140″ or below for the best experience and HDR 4K dynamics. Here are the Theo charts for both the Upgraded UHZ651 and the regular UHZ65. Watch the comparison on YouTube! This entry was posted in AV Solutions, Home Theater and tagged 4k, 4k hdr, 4K Laser UHZ65, BT 2020, BT2020, color mapping, Contrast, DCI-P3, HDR, High Dynamic Range, image scaling, Optoma 4k UHZ65, rec 709, REC709, THEO-Z65, uhz65, Upgraded UHZ65, wide color gamut. you are amazing.., words and information represent the section so effectively and impressive and otherly you are amazing with your products..quite appreciable. 1. if you are doing some changes in the projector electronics or just tuning adjustmen? 2. If or how does it affect the guarantee? 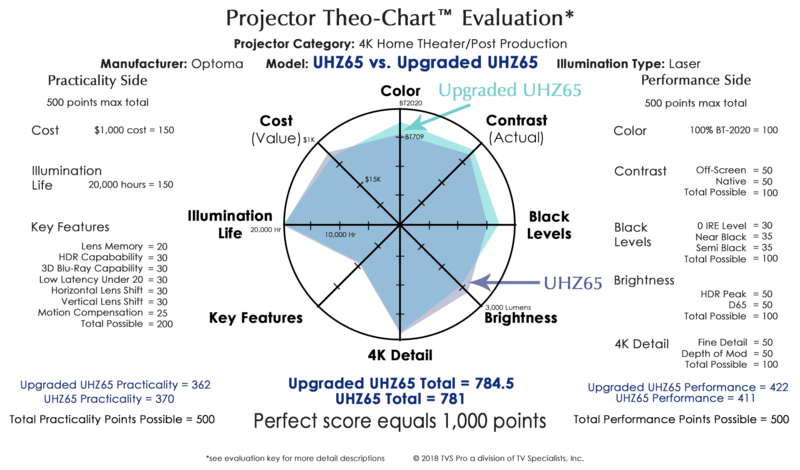 As mentioned in our press release (https://www.tvspecialists.com/new-upgraded-uhz65-4k-laser-projector/) we are adding and utilizing “a custom engineered PureChrome©* ultra-efficient cinema filter”, in addition, we’re performing optical modifications. Each projector is also individually calibrated to the REC709, DCI P3, and BT2020. In regards to the warranty, Optoma USA has approved this modification and the warranty for UHZ65’s bought in the USA are still valid.